SOS Children’s Villages Greece provides support for unaccompanied refugee children in a city facing a care crisis. It is a busy day at the SOS Children’s Villages shelter for unaccompanied refugee boys in Athens. There are emotional goodbyes for a 17-year-old from Pakistan who is joining his sister in Spain. Children returning from school take a lunch break before going upstairs for language classes. And, in another emotion-filled moment, the staff have just received news that three brothers from Afghanistan who have been at the shelter for ten months have been granted asylum in Greece. In a country struggling to meet the needs of thousands of unaccompanied refugee children, this is not an unusual day at the SOS Children’s Villages shelter. The organization has gained recognition for the quality of support it provides for unaccompanied children, including the in-house legal support that is credited with cutting weeks – even months – off the asylum and family re-unification process. Many of the children experienced major trauma both in their homeland and during their journey to Europe. Helping them to address depression, social withdrawal, fear and violence requires time, expertise and a living environment that nurtures trust and respect, according to Mr Vahedi. The need for help is overwhelming in Greece and in Athens, where one-third of the more than 50,000 refugees live. Local officials acknowledge they have not been able to provide adequate shelter for the more than 3,100 unaccompanied children in the country, leaving around 2,300 unaccompanied refugee children living in reception centres and in some cases on the street. 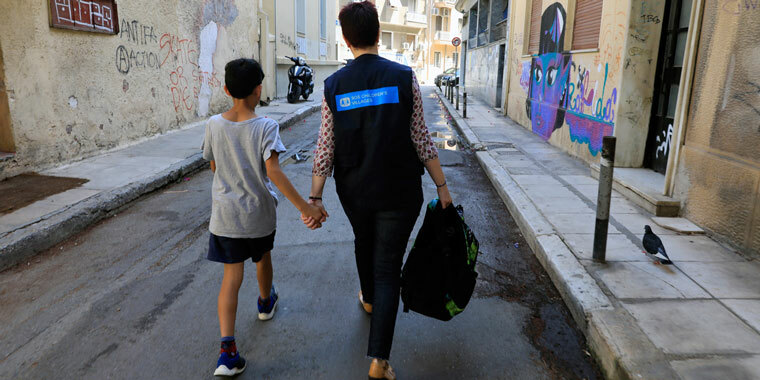 City officials say there are around 15 shelters for unaccompanied children in Athens, including the shelter for boys and a new home for girls operated by SOS Children’s Villages Greece, and that it could be months before more are available. SOS Children’s Villages has operated a shelter for 25 unaccompanied boys in Athens since April 2016. A new shelter for girls opened in May 2018 with a capacity for 10 children.